This fresh fragrance combines slight floral notes with cool melon, lemon and grapefruit scents. A refreshing fragrance to transport you away to a serene place. This candle has added Lemon and Grapefruit pure essential oils which are perfect for creating a positive and productive atmosphere. The candle is blue in colour and has small white and green 3D hearts around the edge. 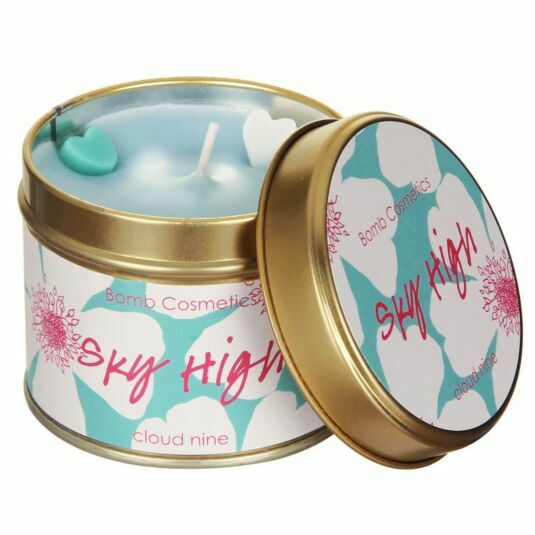 It is presented in a gold coloured tin which is decorated with floral imagery and the words ‘Sky High’ and ‘cloud nine’. These will look great displayed in any room and would make a great gift for a friend or loved one.